The Boise Hawks scored 10 runs in this August 1990 game and Joe Williams accounted for two of them, according to The Spokane Spokesman-Review. Williams scored twice in the contest, including once in the fourth when Williams led a series of three singles to score the game's sixth run, The Spokesman-Review wrote. Williams began his professional career that year. He also ended it that year. That big August 1990 contest turned out to be one of the last in his professional career. He played only that single season. 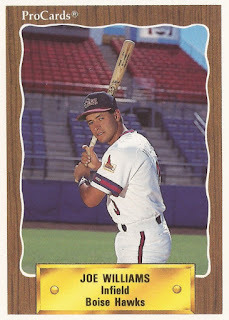 Williams started with the Angels, taken in the 23rd round of the 1990 draft out of New Mexico State University. Williams' 1988 to 1990 run at New Mexico State remains in the record books there. He scored 77 runs in 1990 and 171 on his career, both still in the top 10. He hit 22 doubles in 1989 and 43 on his career, according to the school's media guide. His 25 home runs in 1990 are still tied for second-best in a single season, as are his career 40. He knocked in 155 runs over his three seasons. He hit .401 in 1990. Williams then played his professional season at short-season Boise. He got into 41 games, 81 at bats. He picked up just 10 hits and a single home for a .123 average, marking the extent of his pro career.